There’s nothing quite like the Rio’s World Series of Poker, but one event is slated to rival the largest tournament series of them all. It’s the $500k Super High Roller Bowl 2015, guaranteeing one of the largest prize pools in the history of the game at $25,000,000 and running from July 2-4 at the Aria Casino & Hotel. If those dates look familiar, they should. Just a mile north along the Las Vegas Strip lies the Rio All Suit Hotel & Casino, where the 2015 WSOP will be taking place at the same time. Event #64, the historic $1k WSOP Online Bracelet Event will begin at noon on July 2nd, followed by Event #65, a $1,500 7-Card Stud Hi-Lo 8 or Better set for 4:00pm. Three more WSOP events will get underway on July 3rd, but interestingly enough, there’s no WSOP action scheduled for July 4. That’s the day the Super High Roller Bowl will see its final table action come to a head, and just 24 hours before the start of the 2015 WSOP Main Event on July 5. No doubt, every poker pro and business magnate who participates in the $25 million GTD Super High Roller Bowl will be making their way to the Rio for the big day. The timing is undeniably impeccable, as is the skill level of the elite poker pros already registered for this exclusive poker tournament. With a half-million buy-in required just to get a seat, it’s no surprise that almost every member of the poker world’s all-time money list has already posted the entry to get their name on the roster. Only one player in the Top 10—2014 WSOP Champion Martin Jacobson (#9 – $14,930,606)—hasn’t secured his place at the tables. Whether he intends to join in is unknown, but you can be sure to see the rest of the all-time money winners at the Aria, including Daniel Negreanu (#1 – $29,973,908), Antonio Esfandiari (#2 – $26,407,317), Erik Seidel (#3 – $24,065,940), Daniel Colman (#4 – $22,894,180), Phil Ivey (#5 – $22,482,692), Sam Trickett (#6 – $19,686,727), Phil Hellmuth (#7 – $18,285,370), Scott Seiver (#8 – $15,457,224), and John Juanda (#10 – $14,653,067). Other poker phenoms set to appear at the Super High Roller Bowl include famous names like Bobby Baldwin, Brian Rast, Dan Smith, Doug Polk, JC Tran, Jean-Robert Bellande, Sorel Mizzi and Isaac Haxton. Also worthy of mentioning, Daniel Cates will finally get to meet up with his old ‘Durrrr Challenge’ nemesis, Tom Dwan. Considering the less than amicable history between them resulting from that multi-year soiree, it would be most interesting to hear the interactions if these two end up at the same table at some point. 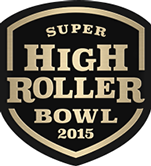 See the List of Players Registered for Super High Roller Bowl 2015 here. According to the website, the 1st place prize has been estimated at $8.25 million; 33% of the overall $25 million guaranteed. However, that figure is based on 50 entries – the number of players needed to meet the guarantee of $25,000,000. Already, the list of players is at 57, increasing the prize pool to $28.5 million and promising at least $9.4 million to the eventual winner.